My blog post last week mentioned the amount of work and planning that it takes to host our Customer Engagement Marketing Summit. Well, the work also has its rewards. This week, as I walked the venue with our audio/visual vendor, the excitement was evident in my voice. Our discussion about the kind of speakers who would present at the event brought back some great memories from last year. I get excited when I recall the people who filled the conference venue. They represented a wide variety of organizations that came with one common goal — to further master the art of customer experience and engagement. I explained to the A/V vendor about the learnings that were shared and the animated conversations that occurred during meals and breaks. There were plenty of opportunities to network and to forge new friendships. Last year’s CEM Summit featured a powerful lineup of speakers from industry giants as Coca-Cola, Intuit and Symantec who shared actual experiences to help B2B and B2C marketers address the challenges of delivering a personalized customer experience. After all, as marketers, one of our biggest challenges is improving the relationship with our customers and prospects. When my visit with the A/V vendor was over, it was time to get back to the task at hand — finding dynamic speakers from global brands who can energize and enlighten the attendees at our 2013 CEM Summit. If you are a speaker with a compelling case study to share, send your proposal to me at cemsummit@possiblenow.com. And if you are a marketing professional who wants to delve deeper into the strategies that work for customer engagement, be sure to mark your calendar for this educational event. 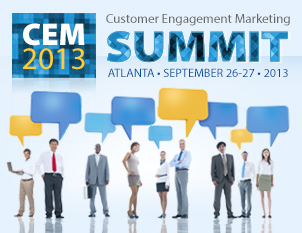 You can find out more about the Customer Engagement Marketing Summit at http://www.cemsummit2013.com.